“Obviously I do not feel sorry. My reaction was just logic, reasonable then, and I think I would do it again,” said the Palestinian teenager. 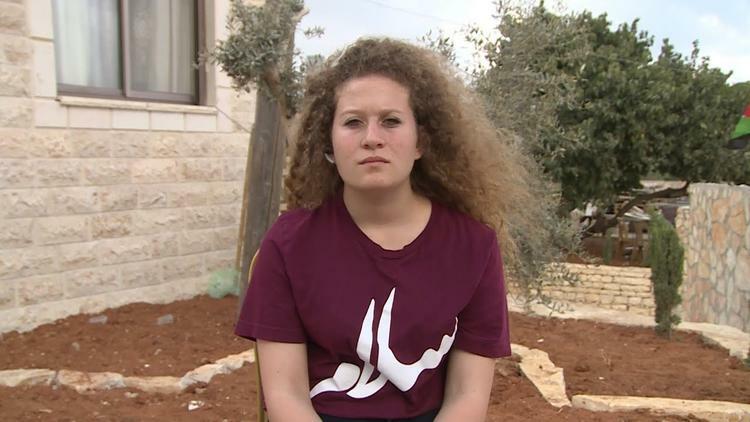 “I’m very happy obviously, but not completely satisfied because my brother remains in jail, along with my siblings,” said in an exclusive interview with teleSUR Palestinian teen Ahed Tamimi, who was held in an Israeli prison for slapping a fully armed Israeli soldier in the occupied West Bank town of Nabi Saleh. It all started on a Monday, she recalled, when Trump declared Jerusalem the capital of Israel: there were a lot of tensions, not just in Nabi Saleh but all across Palestine. “Soldiers broke into my village and started shooting at homes, then they went to the mountain and shot a small kid, 15 years old, who was on the verge of death, he was my cousin. The soldier who shot him came back and stopped at my house’s door. He started shooting the small kids, the homes, the youth, so obviously when I saw that, I told him to go away but he wouldn’t so I slapped him. Tamimi was arrested on December 19, 2017, days after being filmed – with her cousin Nour Tamimi – slapping and kicking two Israeli soldiers who had invaded the Tamimi home, near Ramallah. The 17-year-old – who celebrated a birthday while behind bars – garnered international attention and major support from high-profile artists, actors, academics and athletes across the globe.